Each equine produces 50 pounds of manure daily, up to eight tons a year. And that's not counting the additional weight of soiled bedding materials, or the 10 gallons of excreted urine. Manure tops the list of dilemmas for horse owners. According to Alayne Blickle, there might be gold amidst the dross-if you compost the manure properly. "Manure is worth about $125 or more a year in nutrients," the director of Horses for Clean Water notes. "There are many reasons to compost and reapply manure to the land. Best yet, as a horse owner, it's free, so you might as well take advantage of it." and improved neighbor relations, in addition to the obvious bonus of pasture fertilization. "I see manure composting as a win-win," Blickle says. "Another bonus-the heat in the process destroys pathogens and breaks the parasite cycle." Composted manure is a valuable soil amendment. "It makes plants heartier and more disease-resistant. It's odor-free, so there are no complaints from your neighbors. And no flies," Blickle points out. There are fewer concerns about nutrients leaching, since composted manure retains its nutrients. The best way to turn a problem into an asset is to put manure in a pile four feet in diameter and at least four feet high, and think of it as a living organism that needs air and water. "Too much or too little of either will upset the composting process," Blickle advises. "Yes, you can turn it with a pitchfork regularly, but using a passive approach is best." Once you make your four-foot pile-and keep it at least 200 feet from the barn-you need to aerate it. Blickle recommends putting a couple of PVC pipes through the middle to make sure air circulates. Or take a tamping rod and wiggle a hole in the pile. "You want air, you want it to stay aerobic. It should smell organic, like soil. If there are bad odors, then something is not right," she says. The compost pile should stay about as damp as a rung-out sponge, Blickle says. Too wet and it will rot; too dry and the process stops. Cover the pile with a tarp. 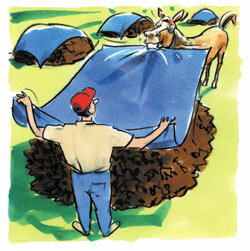 Any tarp will do, whether an old vinyl shower curtain or a snazzy UV-resistant, composting-only sheet. "You need to control moisture, and the tarp is the best way to do it, especially in a rainy season. This is how you keep those sediments and nutrients in the compost instead of in someone else's yard. Environmentally speaking, if you do nothing else, cover your manure pile." When rain is not a problem, keep the pile wet. Hose out your mucking-out wheelbarrow with water till it's soupy and dump it on the pile. Keep the compost damp, but not soggy. Stall bedding adds another quotient to composting. "The natural balance in manure between carbon and nitrogen is about 30 to 1. That's perfect for composting," explains Blickle. "But in a lot of commercial boarding situations, there's so much bedding in the stalls, that the ratio goes up to 200 to 1. The problem is compounded if the stall is bedded with evergreen shavings, which take a very long time to compost. The best compost has as little bedding as possible; make use of rubber floor mats instead," she advises. Although mushroom growers and other agricultural enterprises might love straw stall waste, it's not great for backyard composting. "Recycled newspaper bedding is an excellent product, and many academic studies show it's dust-free and very absorbent. It composts faster and hotter," Blickle notes. She advises looking around your area to see what others are using. Don't forget to visit with your veterinarian about your bedding choice, especially a new choice, to make sure it's not toxic to your horse. Blickle applies compost when plants are growing and can best utilize the nutrients. She limits the application to four inches per year, and not more than one-half inch at a time. "That might sound like a lot, but it's not," she says. "It usually ends up that you need more compost. I have five horses on four acres, and I don't have nearly enough compost." If you don't want to use the compost, friends and neighbors may welcome it for their gardens and lawns. "I've even known people to be creative, bag their compost, and sell it at a little roadside stand," Blickle says. Contact your local Conservation District, the USDA Natural Resource Conservation Service, or local Extension office for more information. Read the next horse farms article on Farm Management.